On 16 September, almost 3.000 runners faced, here in Progetto Manifattura, two obstacles of the 20k StrongmanRun. The winners of the sixth edition in Rovereto were Paolo Gallo from Piemonte and Alessia Scalet from Trentino. A special mention was also given to the 71-year-old Carlo Papa, the oldest runner who finished the competition. Among the participants, mainly from Trentino, Veneto, Emilia Romagna and Lombardy, there were also Germans, Swiss and Slovenians. More than 500 people with their heads up to discover our 160 year old history casted on the Clock Building walls thorugh the videomapping technique: it happened last week during the performance of the science writer Mario Tozzi, produced by Mismaonda and Trentino Sviluppo for the Oriente Occidente dance festival. REbuild took place for the first time in September 2012 and has seen 400 visitors, 100 speakers from 7 countries and a total of 34 among plenary and parallel sessions. January 21 brought a delegation from IAG (Italian Angels for Growth), on a visit to learn more about Trentino’s business and startup culture, to Progetto Manifattura. The evening event was marked by startup companies making pitches of their business strategies, including Greenprefab, Noivion e Mobirev. It was a great meet-up of potential investors and over 100 other enthusiastic young entrepreneurs. REbuild recently held a press conference with the help of the autonomous Province of Trento. 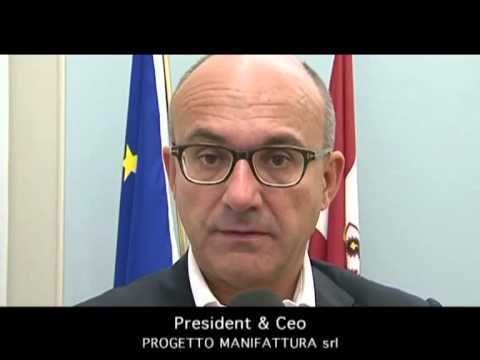 Gianluca Salvatori, Progetto Manifattura's President and CEO, explains the main aims of the REbuild: National conference on Green Building Retrofits taking place in Riva del Garda in September 17-19, 2012. This September the city of Riva del Garda (TN) will host REbuild the national convention that will provide best practices, case studies, and experience that promise to transform Italy’s retrofit construction market. [[wysiwyg_imageupload:264:height=116,width=100]]Progetto Manifattura is participating at Roveret's Notte Verde (1-2 June), a green event organized by the city to promote the adoption of a more sustainable lifestyle. [[wysiwyg_imageupload:209:]]Green Drinks Rovereto to Progetto Manifattura on April 16 at 6 p.m. Join us to meet people interested in greening the economy. [[wysiwyg_imageupload:214:]]The Hub Rovereto will present a workshop on ecodesign Thursday 12 April 6-8 pm. The event - organized with the support of Progetto Manifattura - is being produced in collaboration with The Hub Madrid and The Hub Siracusa. The event will be broadcast in Web streaming in the Madrid and Syracuse locations. For more information contact: nicola.cerantola@ecologing.es or visit: www.ecologing.es. A few fotos from the Natura Mente Vino event inManifattura.